The Port & Company Youth Long Sleeve Tie-Dye Tee Style PC147YLS is available in sizes Youth Sizes: XS(4) S(6-8) M(10-12) L(14-16) XL(18-20) and may be purchased in your choice of the following colors: Gold, Kelly, Neon Rainbow, Orange, Pink, Rainbow, Royal, and Turquoise. SKU: SM-PC147YLS Categories: T-Shirts, Youth Tags: youth activewear, youth clothing, youth long sleeve t-shirts, youth t-shirts Brands: Port & Company. 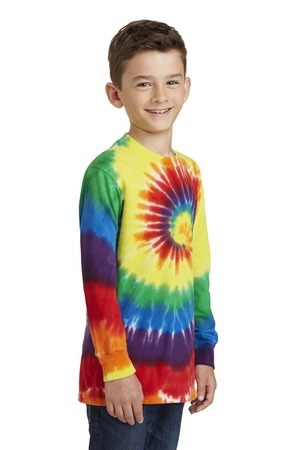 The Port & Company Youth Long Sleeve Tie-Dye Tee Style PC147YLS is available in Youth Sizes: XS(4) S(6-8) M(10-12) L(14-16) XL(18-20) and may be purchased in your choice of the following colors: Gold, Kelly, Neon Rainbow, Orange, Pink, Rainbow, Royal, and Turquoise. Colorfully cool this groovy tee is a surefire way to stand out from the crowd. The tie dye process infuses each garment with unique character. Please allow for slight color variation.